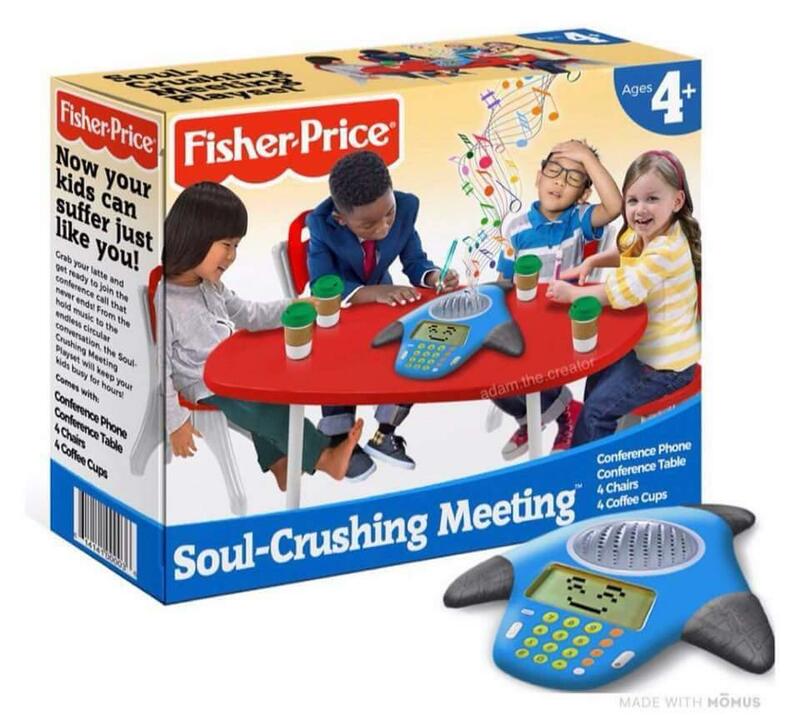 I hope the playset includes the mandatory 15 minutes of technical set up as people attempt to connect their computers; dial into the meeting; get off mute; work through the echo; and the inevitable hilarity which kicks off nearly every meeting these days. But the fact that this simple image resonates so loudly should force us to ask a bigger question: Why are we willing to subject ourselves to soul-crushing meetings in the first place? My CMO team and I were early adopters of Microsoft Teams — about 18 months ago when it was still in internal Beta. It operates as a hub for teamwork in Office 365, and at its most rudimentary level think of it as a UI which joins the disparate parts of Office, such as SharePoint; OneNote; Power BI; and Yammer … which until Teams came along all had to be accessed separately and all had unique file directories. It was a challenge to find and collect information — the passive aggressive way to tell someone to leave off inside Microsoft is that when they ask you for a file, you say: “…it’s on the SharePoint,” knowing full well that they will NEVER be able to find a single file that way. The brilliance of Teams is that it connects everything around the construct of a project or any other logical organizing principle, so that everything which has to do with that project is accessible across multiple databases to everyone on the team. It also enables real-time editing without “checking out” files … it’s a true modern collaboration tool. Some folks are calling it “Slack + Google Hangouts” and while that’s not wrong, it’s much more than that because it organizes everything in Office 365 — it takes *everything* you’re working on and puts it together. It’s particularly good for sales teams who need to organize all their documents around a customer. One other little-known fact — the Skype for Business client within Microsoft Teams is a cloud-based next gen product, and is significantly more stable, louder, and easier to use than the old Skype for Business on-prem product. So, even if you do have to have a meeting, you get online faster, things work more smoothly, and it’s easier to visually connect with the participants. It’s a switch worth making. I do not have any financial interest in any of the products or publications profiled on this site (except when I’m talking about my employer, who pays me a salary). In fact, if you look closely you’ll notice I’m not running any ads; not dropping any pixels; not putting affiliate code in any links; and I’m NOT cookie-ing visitors to the site (you’ll never get re-targeted after visiting copernicanshift.com). In fact, this blog is entirely non-commercial, and exists for the sole purpose of marketing education and my own twisted sense of amusement and fun. I don’t even track the number of visitors to the site – I have no idea of the scope or geography of readership. I write these posts because I love these topics, and the act of converting these thoughts into keystrokes helps me to tighten my own marketing theories and to memorialize those thoughts for my own future access. That’s it. Enjoy.